This section details the pre-project and post-project travel times through the corridor in the eastbound and westbound direction using Beethoven to Inglewood as the project's boundaries. Travel time data was provided by INRIX, which uses data from GPS-enabled devices like smartphones and vehicle fleets. 90-Day Update: In August 2017, travel times through the corridor ranged from no change in travel time to 90 seconds in extra travel time compared to August 2016. The greatest travel times were in the eastbound direction during PM rush hour. 30-Day Update: In June 2017, travel times through the corridor ranged from no change in travel time to 90 seconds in extra travel time compared to August 2016. The greatest travel times were in the eastbound direction during PM rush hour. Compared to August 2016, travel times in August 2017 heading eastbound ranged from no change to 60 seconds during the PM commute. Travel times in the westbound direction have a stronger AM peak than the eastbound direction. The difference in travel time was no more than 60 seconds compared to the year before the project was installed. 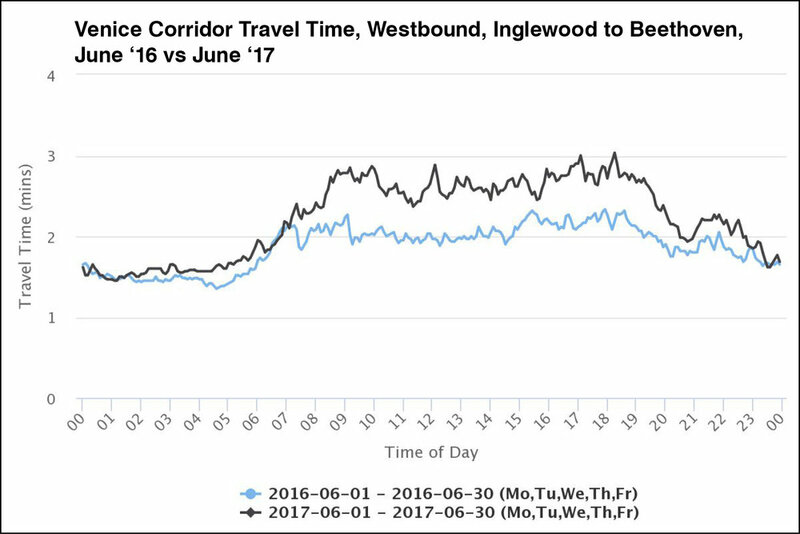 June 2017 travel times in the eastbound direction were up to 90 seconds higher during PM rush hour. Otherwise, for most of the day, travel times were similar to June 2016 before the project was installed. June 2017 travel times in the westbound direction were up to 60 seconds higher in the AM rush hour through to the PM rush hour compared to June 2016.